With an unusual speed when we talk about distances from a smartphone and another smartphone of the same family, Xiaomi returns to the game. It has been less than four months since its debut, but we are talking about the successor smartphone of Xiaomi Mi Mix, the cell phone that the Chinese company put in the market in a limited way and that so much success obtained between users and consumers. The reason? A screen without borders on three of its four sides, and the great relation of screen with respect to the body. It is actually a fact. Xiaomi has confirmed that it is working on the successor of the Mi Mix (whose name is yet to be confirmed, either Mi Mix 2 or Mi Mix II) through a post posted on the social network Weibo by company CEO Lei Jun, who comments that today he had the pleasure to meet again with the international designer Philip Starck, who introduced him the design concept of the next generation of Mi Mix, and as a result they will both continue to study how to bring these exciting innovations to reality of a product. 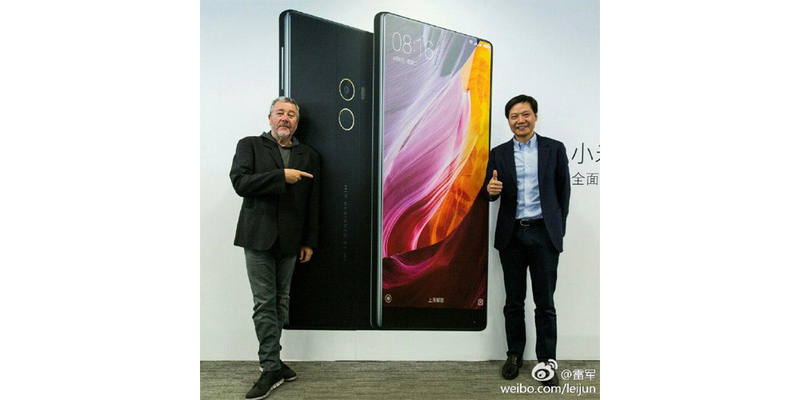 Therefore, Lei Jun has confirmed that the French designer Philippe Starck will once again be working with Xiaomi to develop the design of the smartphone successor of the Mi Mix, after helping to carry out the design of the original model. More details about what the Xiaomi Mi Mix 2 or Mi Mix II can offer are unknown for now, but the Chinese company is likely to try to focus even more on increasing the screen-to-body ratio to provide a devoid device with no edges around the screen. Xiaomi obviously does not want to slow down for a second. The Chinese company continues to introduce smartphones, certifying them and opening up to new markets little by little. In fact, we have detected two new devices that have been certified by the Chinese TENAA, thanks to which we can see the specifications and also the approximate design of both smartphones. According to the latest rumors, the two may coincide with the Xiaomi Redmi 5 and an improved version of the latter. On the other hand, other rumors suggest that it may be the Redmi 4X, a new device that would emerge within the series already proposed by the company, with improved design and specifications. Whatever the identity is, the first model is coded MAE136, equipped with a 5-inch display and HD resolution, octa-core CPU at 1.4 GHz, 3 GB RAM and 32 GB of internal storage (expandable by microSD). The rear camera is 8 megapixels, while the front will be 5 megapixels. Android 6.0.1 Marshmallow on board, and a large battery of 4,000 mAh. The second Xiaomi smartphone is named as MBE6A5, has a 5.5-inch display with Full HD resolution, 2 GHz deca-core CPU, 3 GB of RAM and 64 GB of storage (also expandable via microSD). The photographic section, the version of Android Marshmallow and the battery do not change with respect to the model mentioned above.